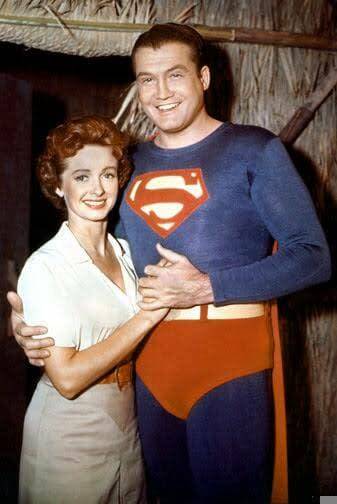 It is with great sadness that I report the passing of my very close friend, actress Noel Neill, the original “live action” Lois Lane from Superman. Noel passed away yesterday at her home in Tucson, Arizona after a long illness. She was 95. Noel Darleen Neill was born in Minneapolis, Minnesota in 1920, the daughter of Minneapolis Star Tribune news editor David Neill and New York vaudeville performer LaVere Neill. She hit the stage early in life in local productions at the age of five, and also offered dramatic radio performances on local Minneapolis stations as early as 1929. She was childhood friends with the Andrews Sisters as they attended dance school together, with Noel eventually branching out as a solo singer and dancer. Noel and the Andrews Sisters barnstormed middle America together playing many of the RKO Orpheum Theatres throughout the region, as well as performing at countless county and state fairs throughout the midwest in the 1930s. After graduating from Central High in Minneapolis in 1938, Noel and her mother headed west by automobile, reaching Los Angeles a week later where she would eventually make her permanent home. Soon after her arrival, at almost 18 years of age, she was hired to sing with Bing Crosby’s band at the Del Mar Racetrack. Other singing jobs followed in San Francisco, Tucson, and in Los Angeles. And then Hollywood came calling. With the help of Crosby, Noel signed a seven-year contract with Paramount Pictures in 1941. She initially made several short films, then appeared in mostly non-speaking roles, gradually gaining leading lady status beginning with 1944’s Are These Our Parents? In total, Noel made close to 100 films in her long and incredible career, and surprisingly, most were Western films made in the 1940s and 1950s. She worked with many noted directors such Cecil B. DeMille, Vincent Minnelli, and Hal Roach, and starred with actors Bob Hope, Crosby, Gene Kelley, Clayton Moore, Johnny Mack Brown and William Holden. But it was her role as Lois Lane in the 1948 Columbia movie serial Superman that caught the interest of fans everywhere. She was bright, funny, assertive but with a quick sense of humor; and opposite film’s first Superman, Kirk Alyn, the serial was a hit which necessitated a sequel, 1950’s Atom Man Vs Superman, again starring Alyn with Tommy Bond as Jimmy Olsen. Her work in the iconic 1950s television series, The Adventures of Superman with the late George Reeves, however, best defined and cemented her legacy as “the intrepid reporter.” After years of playing bit parts in bad films and great roles in forgotten films, she finally found her niche. As a teenager she knew all about the newspaper business from her father and she had also actually written for Women’s Wear Daily in the late 1930s, so it was a role she believed she was born to play. And as she would admit in interviews later in life, she simply played herself. Arguably the most prolific actor in the Superman science fiction genre, Noel would also go on to work with Christopher Reeve in the 1978 film Superman, in the 1980s in the Superboy series with Gerard Christopher, the 2004 Jerry Seinfeld webisode Hindsight is 20/20; and finally, in Brandon Routh’s 2006 feature film Superman Returns. The recipient of many awards over the years, she had long professed that her 2004 Golden Boot Award – for her many Western films – as presented to her by her friend and fellow actor Tom Selleck – was likely her favorite. 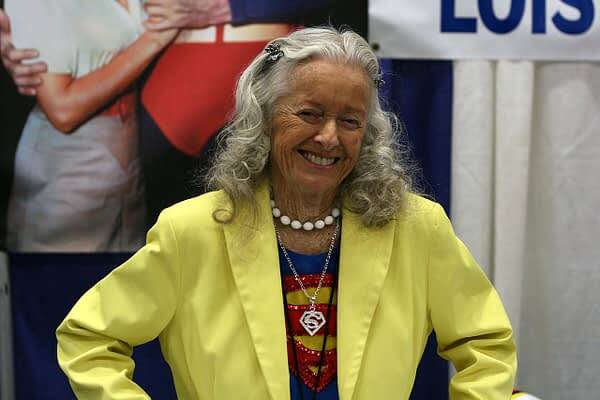 The town of Metropolis, Illinois, which had proclaimed Noel Neill First Lady of Metropolis some years ago, also dedicated a Lois Lane statue in her likeness in 2011 for her love of the role and her many visits to Metropolis over the years. The statue is a popular attraction and has been visited by thousands of her admirers since its dedication. As Noel’s close friend, companion and biographer, I found Noel to be generous with her time and the same person off the screen as she appeared to be on the screen. Her stamina was legendary as she happily made personal appearances and attended book signings well into her 90th year. She was kind, selfless, hardworking, funny with a quick wit, and assertive – all the same qualities that embodied the character of Lois Lane. Noel truly was Lois Lane, and for many of us, she was the first working woman seen on television. Few of her fans actually knew her real name, almost always simply calling her “Lois” to which she would unfailing answer with a bright smile and a kind word. It was more than a role to her. “Lois” was someone she believed in and a character she happily and warmly embraced. 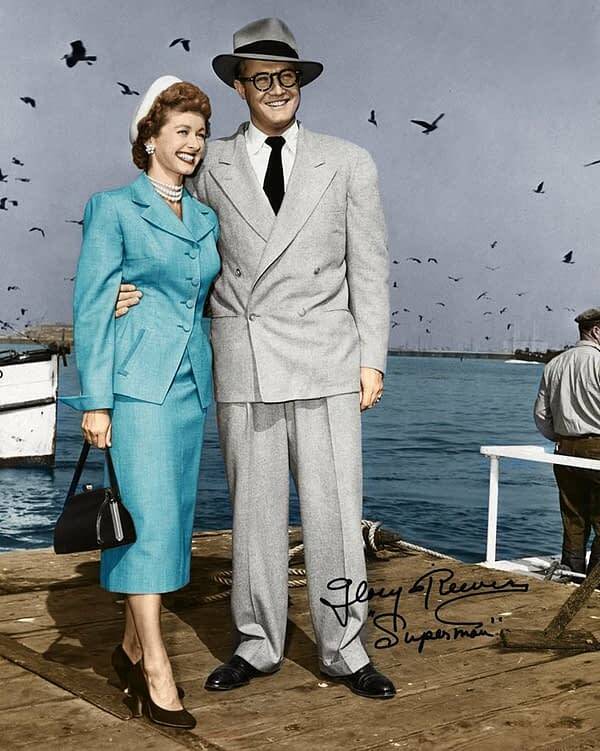 Noel Neill maintained that bright, perky and engaging personality up until her death. Funeral services will be private with a public memorial held later this year.